It is the final Thursday of July 2011. The AGTV Network closes our look at grain handling and storage. We have looked at the basic tools (scoop shovel) to rail cars for moving massive amount of grain. Well before the any handling or storage takes place we have to go back to the field. Today we look at the grain tank on the combine. The grain tank on your combine is the starting point for all the grain handling adventures. Days were that your grain tank held a small amount of grain. Today, due to advances in several areas of crop production, a grain tanks needs hold up 250 to 360 bushels. Grain tanks have optional extensions. These motorized mobile grain storage systems have the most critical role in the entire grain handling and storage process. Grain augers for loading and unloading the grain tank work only a few months out of the year. These components must be in top working order so the maximum yield can be moved through the that grain tank. When you think about the grain tank on your combine, this is probably the hardest working grain handling and storage tank you have, in a temporary mode. The AGTV Network hopes you have enjoyed our look at grain handling and storage systems for July 2011. It is Tuesday July 26th and time for another edition of our Equipment Highlight. Through out July we have highlighted grain handling and storage. Today we look at the most obvious storage solution, a grain bin. There are basically three type of grain bin, a drying bin, storage bin and silo. Also size does matter, how much grain do you need to store? When choosing a grain bin what are your requirement? Bushels, cost (budget), drying or storage. Once source to turn for answers to all of these questions is Brock On Farm Grain Storage. For on-farm grain storage, Brock’s broad line of wide-corrugation and narrow-corrugation bin choices helps you to get the right grain storage bin for the job. BROCK® Bin size choices range from 15 to 54 feet (4.6 to 11 m) in diameter and capacities up to nearly 66,000 bushels (2,200 m³) for the largest farm bin. Brock also offers handling, conditioning and drying systems along with storage bins. More models and choices – from 15- to 54-foot (4.6- to 11-m) diameter bins with a maximum storage capacity of nearly 66,000 bushels (2,200 m³). Strength-providing roof designthat offers the highest farm bin peak load capacities available – up to 8,000 pounds (3,600 kg) with a ground snow load rating of 30 pounds per square foot (146 kg per m²). Choice of narrow-corrugation(2.66-inch / 68-mm wide) orwide-corrugation (4-inch / 102-mm) sidewalls providing a greater variety of bin size and height options. No matter how sophisticated your grain system becomes in the future, the core of that system will always be the bin. Contact us or your professional Brock dealer to learn more about industry-leading systems from Brock – the leader you can trust. Design does matter – experience the Brock difference! Ladders, augers, dryer are all options in addition to capacity. When talking about a dryer these also come in large and small sizes, depends upon how much grain needs to be dried and how much time you want to spend drying. A Sukup Dryer is one option. The simple menu system on the QuadraTouchTM leads you through all dryer operations. The QuadraTouchTM controls use advanced algorithms and calculus to increase dryer efficiency and reduce large swings in temperature and discharge moisture. This system minimizes, and virtually eliminates, under- and over-shooting of your set target moisture content. On-Screen graphs show dryer performance. The system log records all dryer events. The graphs and other data may be easily transferred to a computer for dryer performance analysis and record-keeping. Advanced self-diagnostics and intelligent fault sensing make it easy to trouble-shoot problems. The QuadraTouchTM control box is portable. It can easily be located up to 200 feet away without the use of a heavy umbilical cord. All that’s needed is a 110v plug in and Ethernet cord. The AC Drive on the QuadraTouchTM dryer allows the dryer to operate at 5% metering roll speed, which means you can dry wetter corn (up to 35%). An independent Back-Up Control System that allows you to run all dryer functions in manual mode. Removable media with Microsoft Excel-friendly data formats to allow you to transfer data from the QuadraTouchTM control to your computer. Enough data storage to plot every minute of drying for thousands of hours. Touch panel HMI, Electronic Mod Valve, AC Drive and PLC standard. Of course, the 2009 QuadraTouchTM Dryers also have all of the exclusive features that have made Sukup Dryers so popular. Quad Metering Rolls for more even drying. Grain Cross-OverTM system on stacked dryers. The first dryer to offer true moisture sensing as a standard feature. Large access and clean-out doors. Air and heat provided by proven, efficient Sukup fans and heaters – the best in the industry. How many bushels do you need to handle. In a smaller operation 10,000 bushels may be just the ticket. In a commercial operation 50,000 bushels or more may be needed. Grain bins have been expertly engineered from the ground up, incorporating 85 years of experience into every design. The 4″ corrugated sidewall sheets are engineered for fast erection and greater strength. Heavy-duty wall stiffeners are used on all commercial grain bins. The heavy-duty base plate, which is bolted to the stiffener, anchors the bin to the foundation. Roof is specially re-enforced to accommodate auxiliary equipment and heavy snow loads. The roof is attached to the sidewalls with a heavy gauge top angle and the 30° slope promotes moisture run-off and maximum usable capacity. Westeel has the storage solution for any application. Centurion sidewall sheets are made from G115 galvanized steel which is 25% heavier galvanizing than the traditional industry standard G90 and provides a longer coating life for your steel grain bin against the elements. Most sheets are rolled from high strength 50-ksi steel and are 44″ tall, which means you use fewer sheets that are lighter but stronger; therefore, fewer seams for improved weather protection and faster installation. Their ultra flat 4″ corrugation pattern provides superior cleanout without compromising structural strength. A heavy bottom angle is used to secure the bin and ensure a positive seal between the sidewall and the foundation. Centurion utilizes an all-new upright technology called Variable Section Stiffener (VSS), which works on the principle that the greater the vertical load required, the larger the stiffener section should be. This means the uprights and the section change in thickness from top to bottom. For additional value, our new upright laminating system allows the use of pre-galvanized material and minimizes the use of the splice plates in most connections. Factory assembled and installed, Centurion features a standard heavy-duty 24″ diameter crawl door manufactured on a heavy wall sheet for secure fit and easy access. Westeel double bolts (triple on some large diameter bins) all sidewall sheets with high strength Grade 8.2 JS500 zinc plated bolts. Polyethylene washers ensure a weather-tight seal for each bolt. Designed using the latest in roof design, the Centurion roof features small corrugations formed right into the galvanized roof sheets for increased rigidity and strength, a weather-tight fit at all ribs and an aggressive 30° slope for quick moisture run off. The roof itself is attached with a top angle that provides a positive connection of the roof sheets to the sidewall sheets. An inspection hatch roof sheet provides access to the interior of the bin and comes standard with roof ladder rungs. Wide-Corr’s rafter roof has been designed to take additional loads from auxiliary equipment and can handle up to 10,000 lbs. on Series 54 to 105 bins. Heavy beam roof framing supports, combined with purlins and thrust rods, ensure no sagging or leaking from heavy loads of snow or ice. 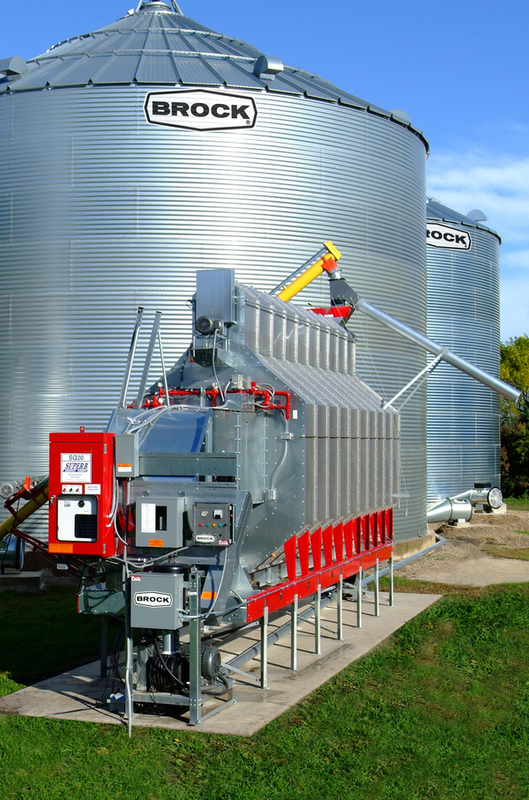 A commercial grain bin does offer more features due to size and capabilities. Of course commercial bins offer drying as well but on a much larger scale. This coming Thursday, The AGTV Network will close out its look at grain handling and storage equipment highlight. On August 2nd we start a new month and choose a segment of equipment to highlight. Follow the Twitter hashtag #food4us during Farm Bill Audits to learn more about farm policy. As part of the continuing series of Farm Bill audits, this hearing examined energy and forestry programs. There is no funding for the Title IX energy progams once the 2008 Farm Bill expires, so Members used the hearing to evaluate whether to continue encouraging feedstock development and how to do so. Forestry programs are permanently authorized and do not require authorization as part of the Farm Bill, but Members questioned witnesses on forestry management and program efficiency. Commodity Futures Trading Commission (CFTC) Chairman Gary Gensler joined industry representatives to testify before the Agriculture Committee on how Dodd-Frank regulations are affecting Main Street businesses. Witnesses representing community banks, public power companies, rural electric co-ops, and manufacturers who expressed concerns that the CFTC’s regulations may go too far, imposing unnecessary costs on their businesses. Nutrition programs account for more than 75% of all Farm Bill spending. The primary nutrition assistance pgoram is the Supplemental Nutrition Assistance Program (SNAP), which was formerly known as food stamps. Members learned about the dramatic growth in SNAP participation and examined ways to cut program expenses without compromising the integrity of nutrition assistance. House Approves “Cut, Cap and Balance” Plan The House passed H.R. 2560, to cut, cap, and balance the Federal budget, by a recorded vote of 234 to 190. GOP House Votes to Limit New Consumer Protection Bureau The House passed H.R. 1315, to amend the Dodd-Frank Wall Street Reform and Consumer Protection Act to strengthen the review authority of the Financial Stability Oversight Council of regulations issued by the Bureau of Consumer Financial Protection, by a recorded vote of 241 to 173. Meeting to Consider Mark P. Wetjen for Commissioner of the CFTC Wetjen pledges to follow Congressional intent and to seek balance in writing derviatives regulation. Committee on Banking, Housing, and Urban Affairs holds Hearing on Enhanced Oversight After the Financial Crisis : The Wall Street Reform Act at One Year. House of Representatives will consider H.R. 2584, the Department of the Interior, Environment, and Related Agencies Appropriations Act for fiscal year 2012. This legislation will take a needed step toward reining in overzealous and job-destroying government regulations. For the most current information, visit http://agriculture.house.gov/hearings/. All public hearings and meetings available for live online viewing. WASHINGTON – Today, the U.S. House of Representatives Committee on Agriculture announced the following committee schedule. Wednesday, July 27, 2011 – 10:00 a.m.
Thursday, July 28, 2011 – 10:00 a.m.
Visit the Committee Hearing webpage for testimony and additional information as it is made available. To watch the hearings live click here. WASHINGTON – Today, the House Agriculture Committee held a public hearing to review the impact of derivatives reform on end users and smaller financial institutions. This hearing comes at a pivotal point in the implementation of Title VII of the Dodd-Frank Act as the Commodity Futures Trading Commission (CFTC) moves from proposing rules to finalizing regulations. Members of the Committee heard from a diverse group of witnesses representing community banks, public power companies, rural electric co-ops, and manufacturers who expressed concerns that the CFTC’s regulations may go too far, imposing unnecessary costs on their businesses. The witnesses expressed concerns that these costs would be passed on to their customers in the form of higher costs. “Today’s witnesses confirmed our concerns that overreaching proposals will negatively impact the very businesses we’re relying on to create jobs. If a rural electric cooperative finds itself in the same regulatory category as Goldman Sachs, the CFTC simply doesn’t have it right. We need to bring some balance and common sense back to this process,“ said Chairman Frank Lucas. Written testimony provided by the witnesses is linked below. The Honorable Gary Gensler, Chairman, Commodity Futures Trading Commission, Washington, D.C.